Make your dream of visiting the Grand Canyon a reality with the help of Grand Canyon Airlines! 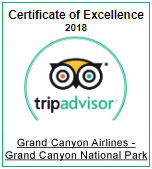 As you partake in this once-in-a-lifetime sightseeing airplane tour, you find yourself captivated with the beautiful desert scenery en route to the Grand Canyon's West Rim. Prepare your camera to capture aerial photos of the famous Hoover Dam, Lake Mead, and Colorado River along the way. Audio narrations in your language will offer interesting facts about each viewpoint throughout your flight. Upon arrival at the West Rim you are free to use a complimentary shuttle service for transport to each sightseeing location. Each viewpoint at the West Rim is unique in its own way, especially for picture-taking! From the massive eagle-shaped rock formation at Eagle Point to grand layers of rock at Guano Point, you will find formations here that simply do not exist at any other region of the canyon. A meal is included and can be enjoyed at any time during your canyon visit, as well. After a fun-filled day of sightseeing and photography, return to your hotel with photos and memories to last a lifetime. Arrive at our state-of-the-art terminal for check-in. Depart on an approximate 35-minute flight with views of Hoover Dam, Lake Mead, and the Colorado River en route to Grand Canyon West. Spend approximately 4 hours at the canyon to explore and enjoy the views from multiple stops along the rim. Shuttle service is offered for free transport to each viewpoint. A take-along meal is provided and to be enjoyed at the passenger's convenience. Depart on an approximate 35-minute return flight to the terminal and check in at the transportation desk for transfers back to your Las Vegas hotel. Request an Airplane window seat? Our "Window Seat Request" allows you to request the window seats of the aircraft you will be touring in. While every seat aboard any of our touring aircraft have a great view, the window seats offer a bit more, utterly unobstructed, photo opportunities. If the aircraft is capable of accommodating your request then the price per window seat is $15. This charge is payable when your request is confirmed after check-in. We accept most major credit cards as well as cash & travelers cheque. © 2002-2019 Grand Canyon Airlines, Inc.